Providing you the best range of chair pad, brocade chair pad, art silk golden kantha work square chair pads and leaves hand block printed cotton chair seat cushion with effective & timely delivery. "Use this attractive cotton made, hand block printed chair seat pad from Rajrang. Make your chairs more comfortable be it indoor or outdoor. This seat cushion has generous fill of cotton that makes it light in weight. High quality thick fabric used for longevity and durability. Use these on the kicthen chairs, dining chairs or garden chairs as well. The two ties at both the ends of the chair pads helps to keep the cushions at one place. Dry clean only to avoid color fading." We are offering our customers an excellent quality range of Chair Cushion Cover. Wholesale Hand Block Printed Chair Pads. 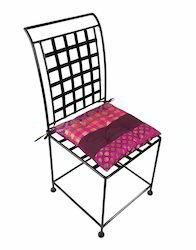 we are engaged in manufacturing and exporting wide range of All Type of Chair Pad. 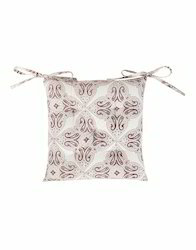 Our products include such as Hand Block Printed Chair Pad. Beautiful Chair Pad made of soft cotton cloth. Indian Hand Block Printed Chair Pad. Traditional Chair Pad has made from experienced craftsmen. 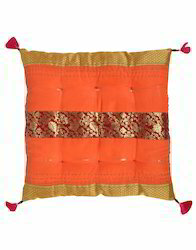 "Use this beautiful art silk made; Kantha work chair pads from Rajrang. Make your chairs more comfortable be it indoor or outdoor. This seat cushion has the generous fill of cotton that makes it light in weight. The high-quality thick fabric used for longevity and durability. Use these on the kitchen chairs, dining chairs or garden chairs as well. The two ties at both the ends of the seat pads help to keep the cushions in one place. "Use this attractive cotton made, hand block printed chair seat pad from Rajrang. Make your chairs more comfortable be it indoor or outdoor. This chair pad has generous fill of cotton that makes it light in weight. High quality thick fabric used for longevity and durability. 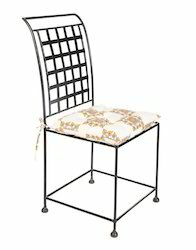 Use these on the kicthen chairs, dining chairs or garden chairs as well. The two ties at both the ends of the chair pads helps to keep the cushions at one place.